ISBN 9790006464272. 7.5x10.5 inches. Key: D major. Language: Latin, Text Language: Latin. Preface: Alfred Durr. 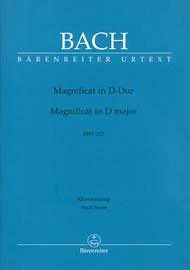 Includes the four inserts from the Eb Major version (BWV 243a) as appendices. 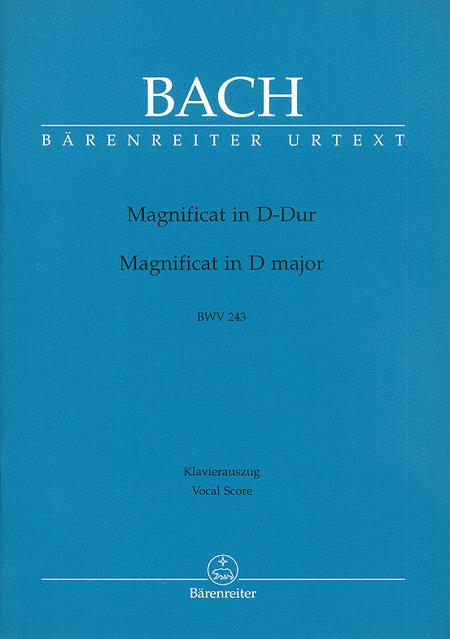 This edition of Bach's Magnificat is beautifully clear to read, with a simplified piano rendition for choir accompanist - I recommend it for any choir that wants a challenge and is prepared to work hard to achieve great music. After years of hard work with Handel's Messiah, I found a refreshing masterpiece to challenge me and the choir members singing an awesome and inspirational work composed by the master of masters JS Bach, the Magnificat in D Major.